What types of items do you carry? 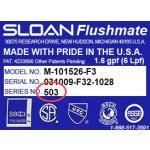 Can I put a Sloan Flushmate system in my existing toilet? Where can I find my tank number? Why is there a Sloan Flushmate system in a different manufacturer's toilet? We carry a colmplete line of commercial plumbing products. We have 95% of the parts shown on the website in stock. We also have many more parts in stock, and we can special order any parts you need. The series number isn't always on the flushmate tank. You will need to compare the pictures we have and find which one looks like your tank. Give us a call at 800-518-5388 and we will help you find the parts you need. No. The Sloan Flushmate system will only work in a toilet that was originally equipped with a Flushmate system. The tank number is stamped on the bottom side of the tank lid, or somewhere inside the china tank. It will either be stamped with ink, or imprinted into the china. Sloan doesn't make toilets. They make just the Flushmate system and distribute them to the different toilet manufacturers. The toilet manufacturers then design a toilet that will work with the Sloan Flushmate system then they install the Flushmate system in their toilets. We will ship your in-stock part the same day if you order it before 2:00 CST. We ship standard ground which usually takes 1-5 days. If you need your parts sooner, call 800-518-5388 to arrange overnight shipping. Special order parts usually take 1-3 weeks. Yes, we take Visa, Mastercard American Express, and Discover. Yes, we do accept purchase orders and offer net 30 terms. We have a thirty-day money back return policy. You may return your item in its original packaging within thirty days for a refund. Shipping charges are not refundable. Please call 800-518-5388 to request a Return Authorization Number before sending your item back. You will be issued a refund after we receive and inspect the returned item. Items must be returned in original package and in new resaleable condition. **Note: Replacement Flushmate Systems are subject to a 25% restocking fee.